“How many licks does it take to get to the center of a Tootsie Pop?” This question was asked in the commercial running before our film in Misquamicut, Rhode Island. I’ve complained this year about ads before movies, but usually these have been ads for Geico or Hulu that are currently running on television and Youtube. The ads before the drive-in screening of 1994’s Forrest Gump were not exactly timely, which made them much more tolerable. The group that organizes the drive-in screenings (most obviously not the Regal Corporation, as this was a community run function) decided to play a number of commercials from four decades ago. Along with a variety of “Let’s all go to the lobby” commercials, there was the one about a boy asking the wise owl for an answer to candy mysteries. They also played the “I’d like to teach the world to sing” Coke ad (which was also used in the series finale of Mad Men). I was most amused by the single tear Indian public service announcement about littering (back in the day there was a brouhaha when it was revealed the actor was not actually a Native American). For all I know, they might always screen these same ads before films (the next night they were showing Jurassic World), but I hope not. The ads made a certain sense playing with Gump which is partially set in the 1960’s. Of course, their thinking may be that the ads fit the nostalgic mood of drive-ins in general, which makes a kind of sense as well. Looking at the schedule of films, the earliest film on the summer calendar is 1975’s Jaws. Many of their featured films are from the eighties (such as Dirty Dancing and The Goonies). Forrest Gump was, and continues to be, immensely popular. It won the Academy Award for Best Picture and Tom Hanks received his second Best Actor Oscar. It spawned a slew of catchphrases and a real life seafood chain. But best of all for us, it features a church with a wonderful Gospel choir. Gump finds encouragement in the church, and in my favorite subplot of the film, Lieutenant Dan finds hope in God. 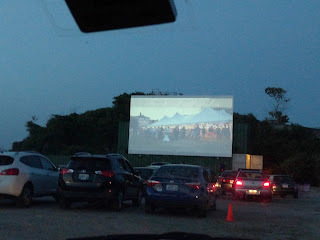 So a good time was had at the drive-in. I just wish they’d showed a Bugs Bunny cartoon. That's a big part of the drive-in experience in my book.